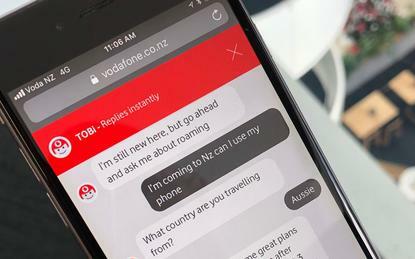 Vodafone reveals the latest member of its AI family - TOBi the chatbot. The chatbot, which is powered by IBM Watson, aims to provide customers with a smooth and efficient way of having simple queries answered. The chatbot, for instance, will be able to help customers with roaming related questions. “Customers can always transition through to a human advisor if they get stuck,” says Helen van Orton, customer operations director at Vodafone New Zealand. Van Orton says there are plans for TOBi to be available through the My Vodafone app in the future, so customers will be able to get their questions answered whenever they want and while they are on the go. TOBi will also be available on the Contact Us page to save customers time on the phone. Visitors to the page will be able to use a search tool so TOBi can direct them straight to the correct team rather than seeing the traditional list of numbers. Van Orton says the chatbot complements Vodafone’s customer service team. Customers are encouraged to interact with the chatbot, as with most AI, TOBi will learn more through experience, she says.